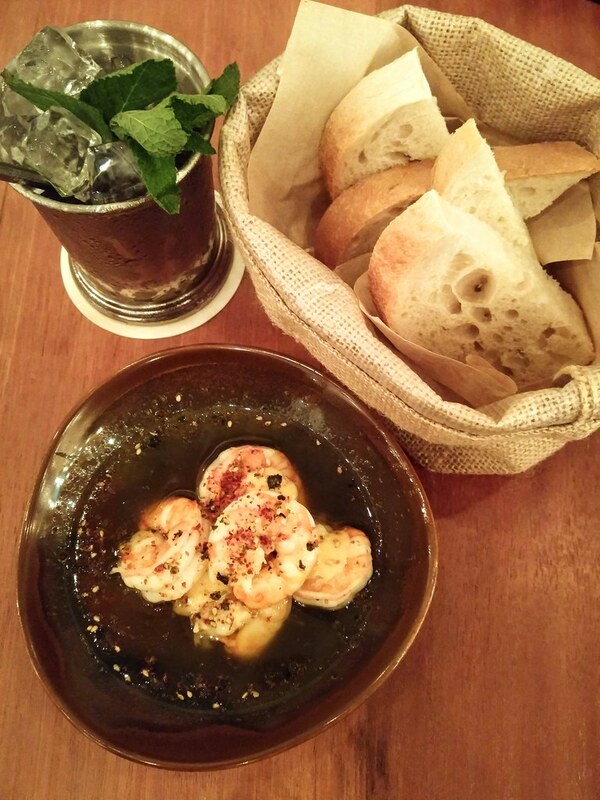 Kinou at Tras Street is a restaurant bar founded on the memories of Chef-Owner Benjamin Tilatti, of the food across the world that he has tasted and experienced during his travel. 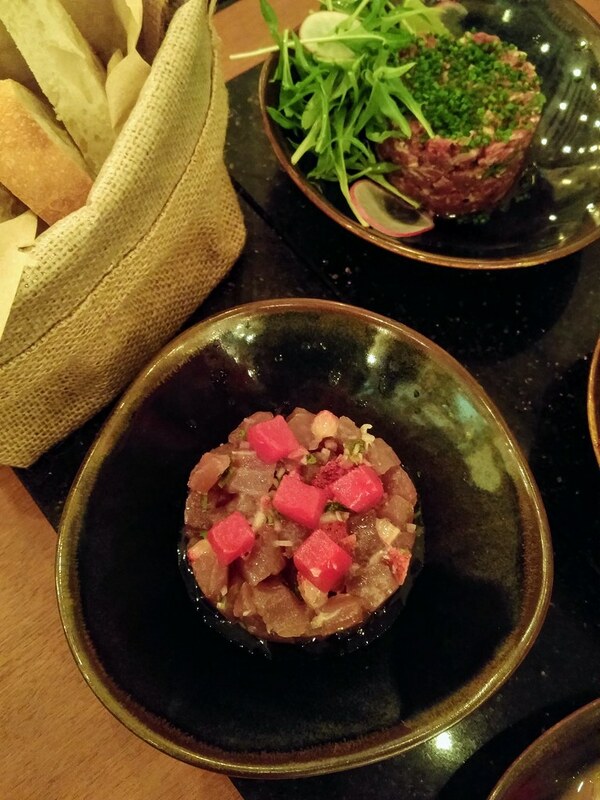 Named after the nickname of his mum who had inspired him to travel the world, Kinou also refers to the two ends of a baguette, which embodies Chef Benjamin's intent to curate a menu that bring dishes around the globe together, ranging from ceviche to tartare and tomahawk, all designed for communal dining. 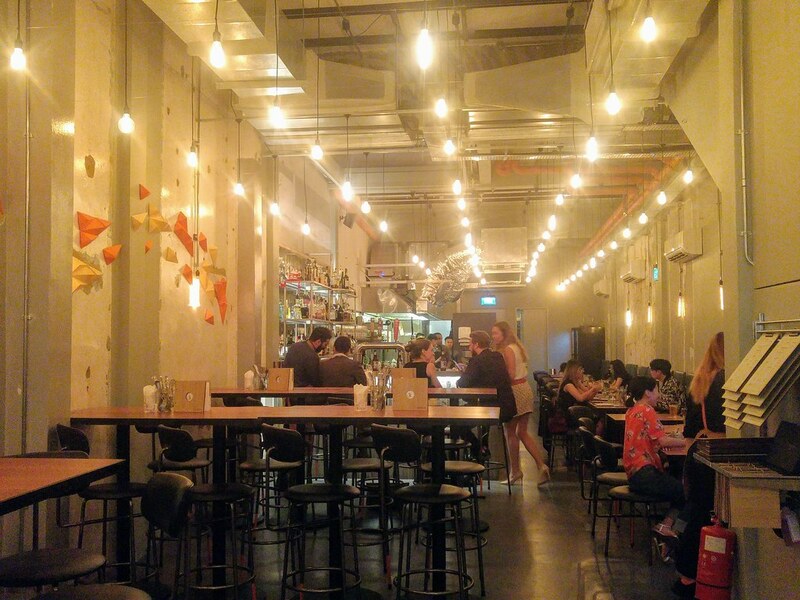 Taking on all three levels of a shophouse, the multi-concept space also includes a members’ lounge and event space. Over here, start off your meal with a tipple from Kinou’s extensive list of drinks, ranging from over 150 varieties of beverages from classic to creative cocktails. And may I inform you that Kinou's cocktails come with the New York pour of 60ml – a double of the typical 30ml pour! We started off with Kinou Prawning Spot ($14), featuring fresh prawns poached in garlic oil, with add-on sourdough to soak up the supposedly decadent oil. Chef Benjamin uses live prawns which is evident from their succulent and firm meat. Coated with garlic oil with a touch of Italian aioli, the lean meat tasted full in the mouth. The garlic oil however pales in comparison with what I had tasted at Claypot Full circle. It just wasn't assertive enough. On the other hand, I find A Cow in the Pasture ($16) more satisfying. 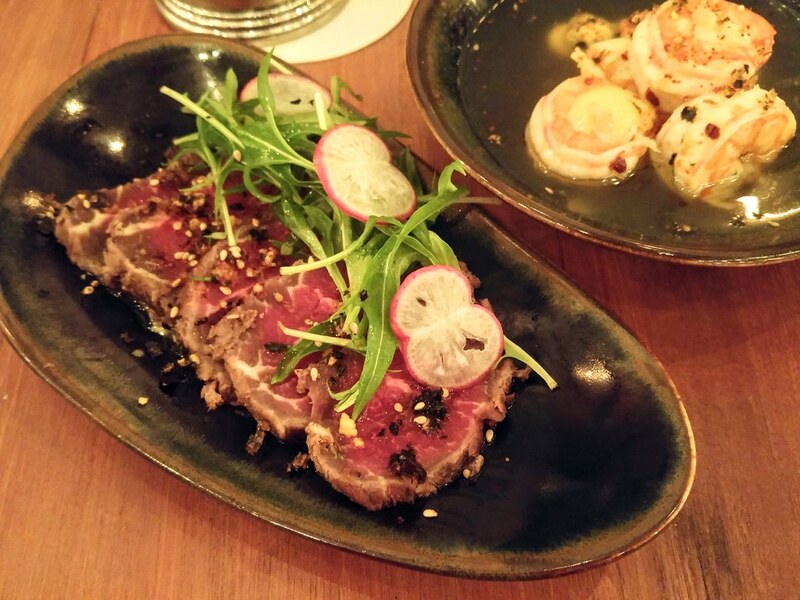 This beef tataki was fatty, luxuriated further by a thin layer of mayonnaise hidden underneath. 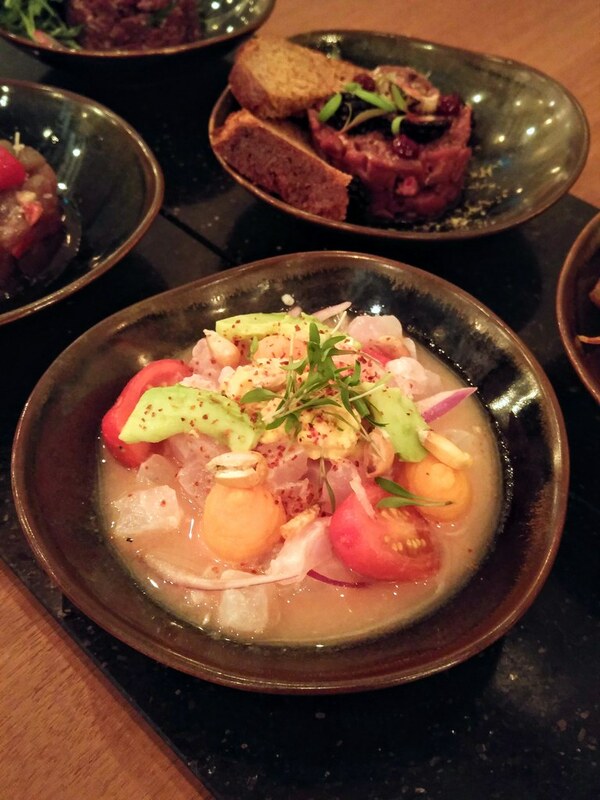 The ceviches and tartares at Kinou can be mixed and matched into platters of three, five or seven options. The more one orders, the better the value. For Ceviches, we had a picturesquely named Tuna on The 14th Of February ($27) and fish of the day, known as Kinou, Lost in Peru ($25). While the latter had all the refreshing notes spot on with the red snapper bathing in tomato and lime marination, the Valentine's Day tuna, adorned with strawberries and dressed in maple syrup, made an impression with its subtle caramelised sweetness and tangy profile. 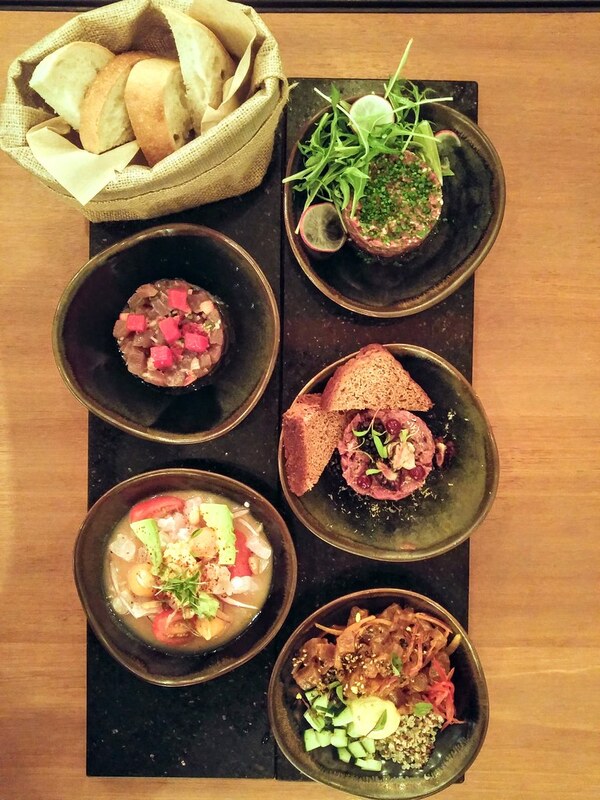 Moving on to the Tartares, we had the Kinou Signature Beef Tartare ($24), Chompchae Deobap ($26) Korean spicy tuna and a highly controversial duck tartare, Whack A Quack ($24) with Foie Gras ($15). 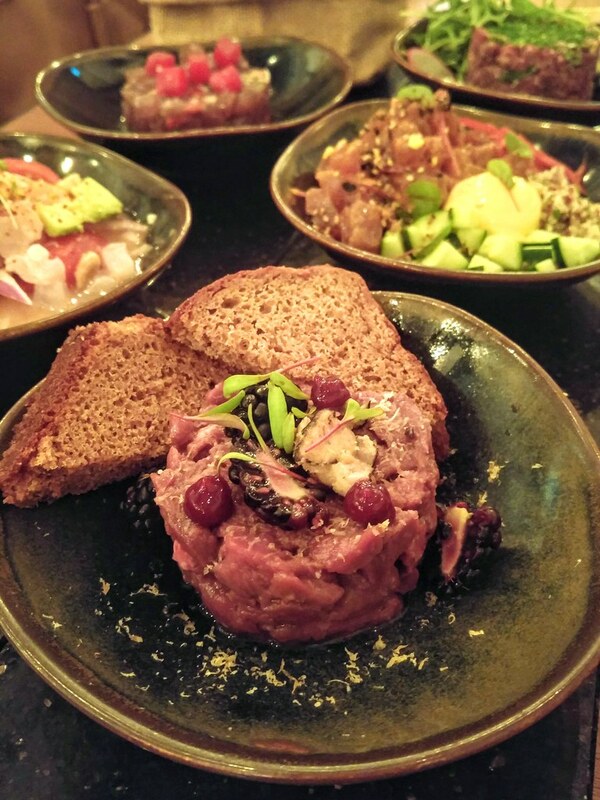 Other than the duck tartare, the tartares here are meant to be lighter on the palate, hence you will not find toasts as accompaniment, such as the Beef Tartare. To achieve that lightness, cheese is used in place of the egg yolk as binding agent, which at the same time, adds a dimension to the overall taste. Chompchae Deobap resembles a poke bowl with a dollop of salted egg yolk mayonnaise to bring the different elements together. I like the crunch from the quinoa and though the salted egg yolk didn't really come through, the Korean sauce didn't come across as too overpowering either hence keeping it light on the taste. From the lightest in taste to the richest, we finally arrived at the Whack A Quack, which we were warned many times about its gaminess. Accompanying the tartare is Gingerbread which Kinou hopes to ease you into the initiation of tasting your first duck tartare with its mellow sweet notes and spice overtone. Surprisingly, the only livery taste that hit me was that of the foie gras, followed by strong nutty nuances which apparently comes from a drizzle of hazelnut oil that has been discreetly but brilliantly drizzled in to harmonize the taste. The tart berries brightened the taste of the red meat with their acidity and sweetness. 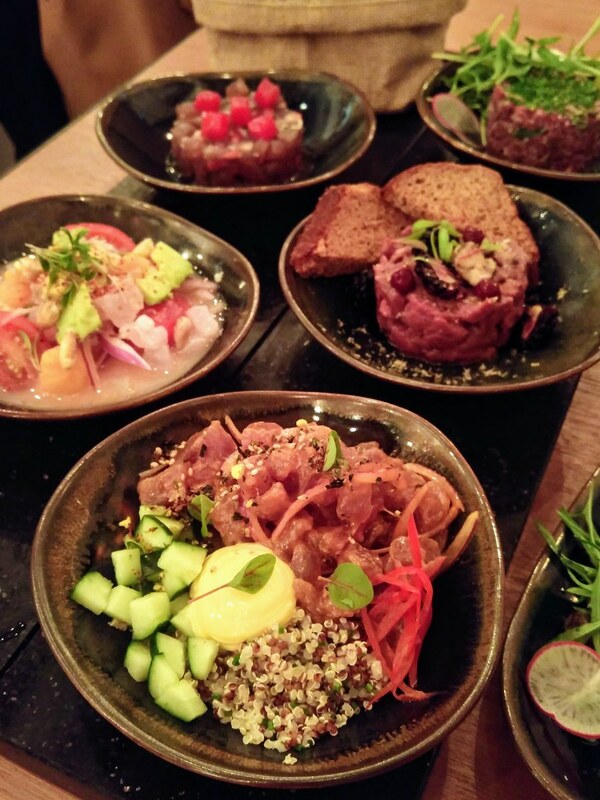 If you trust Kinou to serve the freshest produce on this small plate, it's really all in the mind how you enjoy this rare choice of tartare. 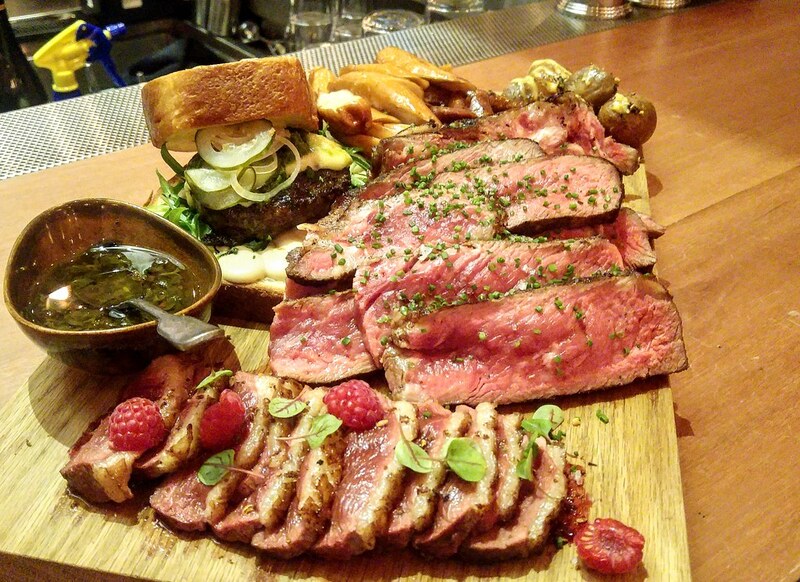 Carnivores' dream comes true with Vegan Nightmare Platter ($99) which consits of 220g Wagyu Ribeye, Kinou Signature Burger, Magret Duck Breast, Lamb and Chicken Sausage, and Hasselback Potatoes. Pretty bloody sight at first but meat lovers will dive in within seconds. My favourite of the lot is the burger. It is juicy and flavourful waygu patty held together by 2 pillow-looking brioche toasts. The brioche was fluffy, with ultra crusty edges that left a buttery aroma lingering on my fingertips. The humble Hasselback potatoes brought me so much joy as my teeth sunk into its fluffy body. And the sausages are worth mentioning too for their taste and texture. They are not so much of an afterthought to the red meats. Named after their head chef who created this dessert, Nadya’s Some Sort of Chocolate Dessert ($15) is a mishmash of sweet and savoury elements thrown into one bowl - miso caramel parfait, chocolate mousse, shoyu glaze and cashew brittle. The miso caramel parfait was soft and creamy but not at all cloying. 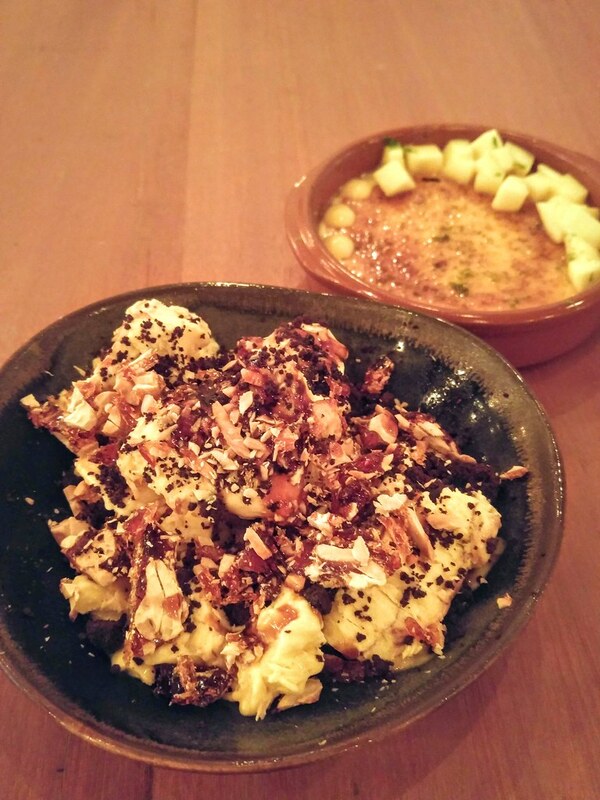 Each crunch of the cashew brittle teased out the savouriness of the shoyu glaze and parfait. And, just before I forgot, the bitter-sweetness of the chocolate mousse gently reminded me that indeed, this is a chocolate dessert. Something French is a Creme Brulee that comes zesty with ginger and kumbuwa. I didn't like this version at all as the kumbuwa was pretty much all I could taste, with the custard struggling to extend its flavour. I was told being raised in a farm where he knew the animals by their names, which eventually became food on his table, Chef Benjamin has grown to respect each and every ingredient on hand - the key recipe for his dishes. 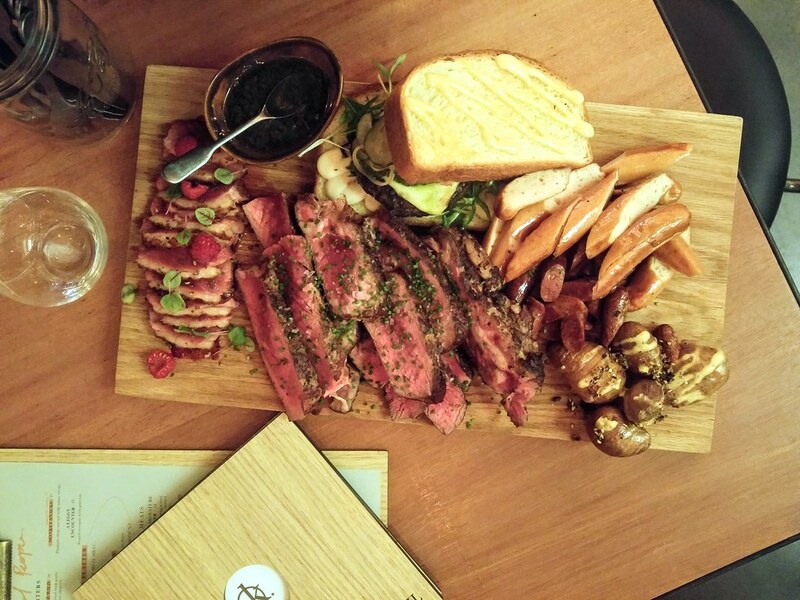 Kinou's dishes rely heavily on fresh and high quality produces, and perhaps only with such respect, a tricky menu like this is made possible.